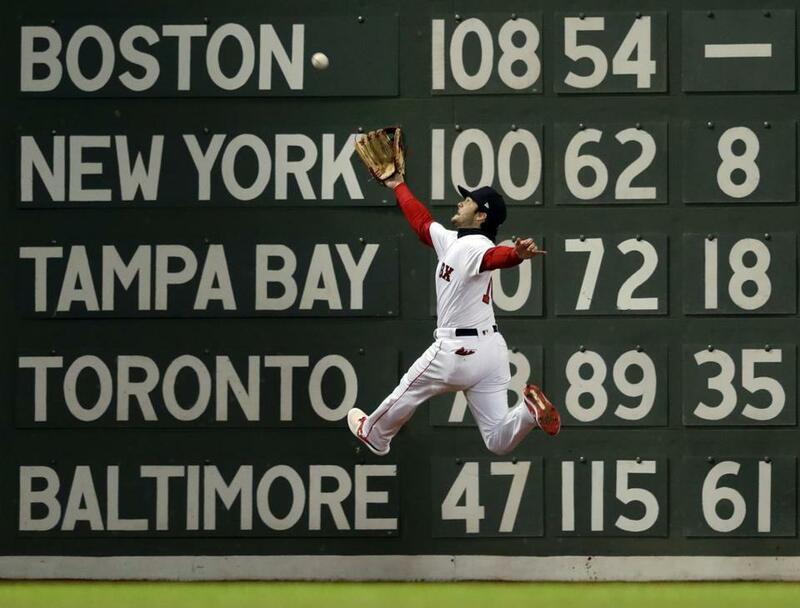 Andrew Benintendi made a leaping catch in front of the Green Monster. 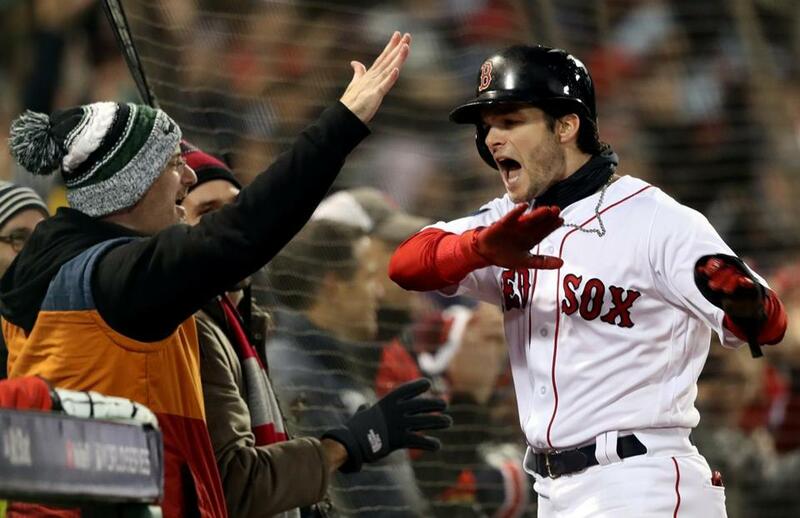 The Red Sox defeated the LA Dodgers, 4-2, in Game 2 of the World Series on Wednesday at Fenway Park. Boston holds a 2-0 lead in the series, which resumes in LA on Friday. Here is Peter Abraham’s game story. Here is the box score. The Sox are 14-2 in the World Series since 2004, 8-1 at Fenway. They've won six straight in this season, eight of nine. These are the good old days. Below are updates and analysis from the game as it unfolded. Top: Craig Kimbrel took on the mound. Manny Machado flew out to center before Chris Taylor and Matt Kemp grounded out to end the game. Kimbrel with a clean save to close out the 4-2 win, the 117th of the year for the Red Sox. The Red Sox have successfully converted all 6 postseason save opportunities. Bottom: Pedro Baez replaced Kenta Maeda on the mound. Cody Bellinger made a sliding catch on the warning track in center to deprive J.D. Martinez of his second hit on the night. Xander Bogaerts flied out to center field , and Rafael Devers grounded out to end the inning. Top: Nathan Eovaldi replaced Joe Kelly on the mound and struck out Cody Bellinger for the first out. Then Justin Turner grounded out to short, and Joc Pederson, pinch-hitting for David Freese, flew out to left field to end the inning. Nathan Eovaldi needed just 13 pitches to get through the eighth. Eovaldi has faced 11 hitters in relief in the postseason and retired 10 of them. Eovaldi, Porcello and Sale as relievers in the postseason: 6 IP, 2 H, 0 R 0 BB, 5 K.
Bottom: Kenta Maeda came in for Julio Urias. After Christian Vazquez grounded out, Mookie Betts hit a towering ball off the Green Monster for a double. Then Andrew Benintendi struck out swinging, and Maeda was pulled for lefty Scott Alexander. Betts advanced to third on a pitch from Alexander that missed outside, but Mitch Moreland, pinch-hitting for Steve Pearce, struck out to end the inning. Mookie Betts dances at second base after a seventh inning double. Eovaldi warming. Presumably, Porcello now gets the Game 3 start. Top: Joe Kelly entered the game for David Price. Max Muncy struck out swinging before Yasiel Puig grounded out to Rafael Devers. Kelly then struck out Yasmani Grandal, pinch-hitting for Austin Barnes, to retire the side in order. Joe Kelly?s changeup completely locked up Grandal for a called third strike. Hitters have such a hard time accounting for that pitch while respecting 98-101 mph fastballs. Bottom: Lefthander Julio Urias replaced Madson on the mound. He retired the side in order. Top: David Price retired the side in order. Seven in a row retired by Price. 6 IP, 3 H, 2 R, 2 ER, 3 BB, 5 K, 88/58. Bottom: Christian Vazquez singled on a two-out base hit to right. Mookie Betts followed with a single up the middle to put runners on first and second. Hyun-Jin Ryu walked Andrew Benintendi on eight pitches to load the bases with two outs before manager Dave Roberts replaced Ryu with righty Ryan Madson, who walked Steve Pearce to bring home Vazquez. A base hit from J.D. Martinez dropped in front of Puig to give the Red Sox a 4-2 lead. Xander Bogaerts struck out swinging to end the inning. J.D. Martinez hit a two-run single in the fifth inning. Andrew Benintendi celebrated with fans after scoring in the fifth inning. Ryan Madson before the game: "Grip is essential obviously in a breaking ball. And a lot of times with the cold weather, I'm not saying anybody uses anything, but if you use anything, a lot of times it's not as effective in cold weather." Top: Andrew Benintendi robbed Brian Dozier of a base hit with a running, leaping grab in front of the Green Monster. Justin Turner grounded out on a soft-hit, bouncing ball, and David Freese popped out to end the inning. Excellent running catch by Benintendi, who also showed the intelligence and body control to change his angle on the warning track once he landed so he wouldn't collide with the Wall. Price had a rough go of the 2nd time through the order vs the Dodgers, who adjusted to the fact that he was primarily 4-seam/change rather than 2-seam/cutter. Bottom: J.D. Martinez grounded out, Xander Bogaerts struck out looking, and Rafael Devers struck out swinging to end the inning. Hyun-Jin Ryu has five Ks on the night. JD Martinez did not look good running out that groundball. Cora said pre-game his ankle was OK but it didn't look it there. They'll have a day off to treat it, but whether he can play OF in LA remains to be seen. Devers has swung/missed badly on curveballs to strike out twice vs Ryu, who was evidently paying attention when Devers badly missed a Kershaw curveball yesterday. Devers' opposite-field approach works well vs LH fastball/slider, but not so much with a 12/6 curveball. 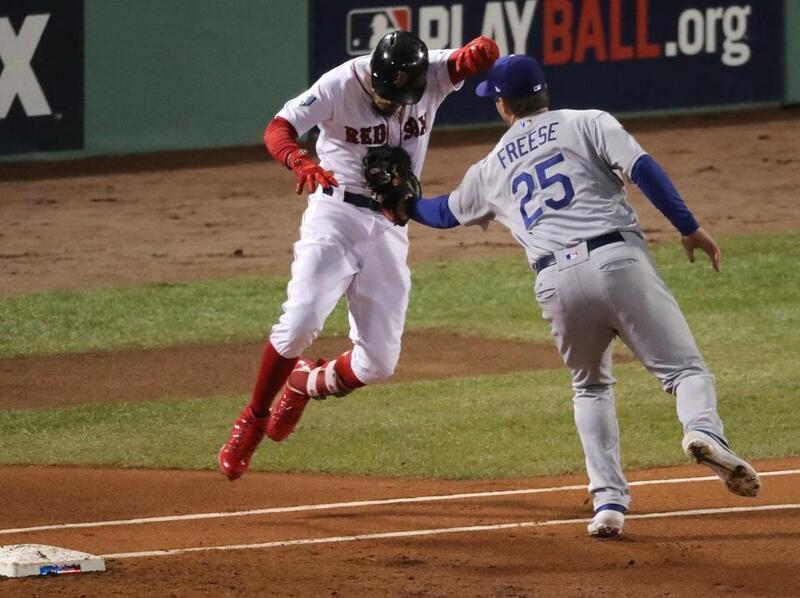 Top: David Freese reached first after Mookie Betts couldn’t come up with the catch on a line drive to right. On David Price’s next pitch, Manny Machado lined a base hit to center field to put runners on first and second. Price then walked Chris Taylor on six pitches to load the bases. Matt Kemp hit an RBI sacrifice fly to center, and Freese tagged to tie the score at 1-1. Enrique Hernandez capped a nine-pitch at-bat with a strikeout for the second out of the inning. Joe Kelly started warming in the Red Sox bullpen. Yasiel Puig launched a hard-hit blooper over a leaping Ian Kinsler to drive in Machado and put runners on the corners. Austin Barnes struck out swinging to end the inning. Price’s pitch count: 67. Between-innings conversation with Price and Kerwin Danley. 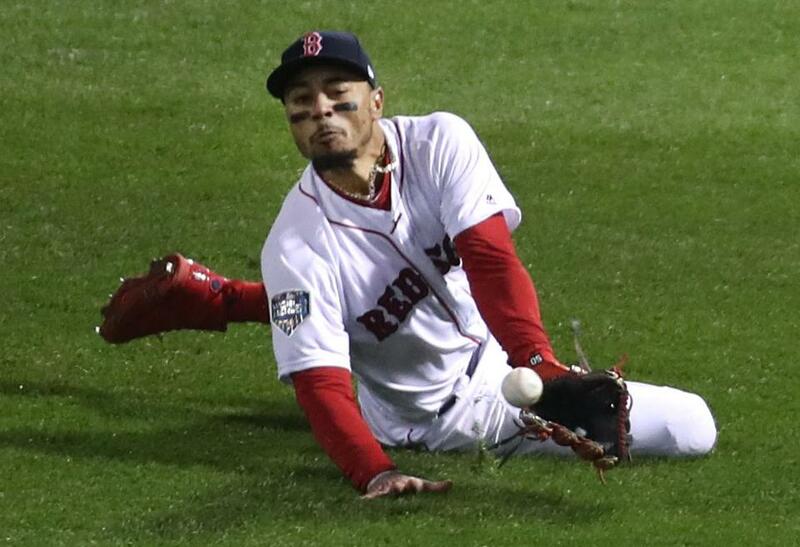 Mookie Betts couldn't come up with the catch on a David Freese line drive in fourth inning. Price made the move to lower his arm slot midyear to get better East-west action on the cutter. His adjustment in Houston raised the release point, and resulted in more north/south pitching ? while also largely taking the cutter out of he mix. Bottom: Hyun-Jin Ryu struck out Christian Vazquez to open the inning. Then Mookie Betts singled to left-center field on a 1-and-2 pitch, Andrew Benintendi lined out to center field, and Steve Pearce popped out to end the inning. Top: Ian Kinsler nabbed a floater by Yasiel Puig for the first out, and Austin Barnes popped out to right field for the second out. David Price then walked Dozier, before Justin Turner grounded out to end the inning. Price’s pitch count: 43. 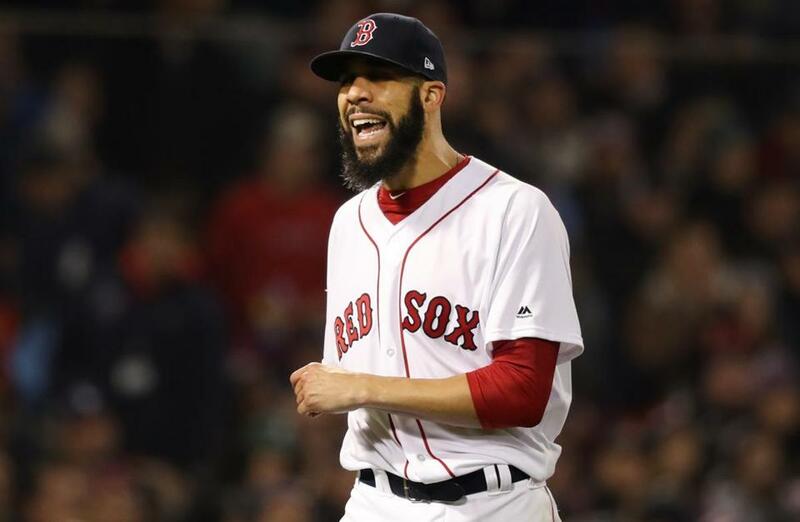 David Price exclaims after what he believed to be a third strike during third inning. David Price now has 10.2 consecutive scoreless innings in the postseason. Bottom: After J.D. Martinez lined out to center field, Xander Bogaerts doubled off the Green Monster for Boston’s first base-runner of the night. Rafael Devers then struck out swinging for the second out. Ian Kinsler lined a base hit to left to drive in Bogaerts, giving the Red Sox a 1-0 lead. Jackie Bradley Jr. followed with a base hit up the middle, but Chris Taylor threw out Kinsler at third to end the inning. Red Sox with two outs and runners in scoring position this postseason: .421 average, .560 OBP, .789 SLG. Perhaps even more ridiculous: they have 9 walks and 5 strikeouts in those situations. Just incredible discipline/approach in pivotal situations. Big hit for Kinsler to drive in a run, poor decision to try and go to third. First egregious base-running error by the Sox in a while. Nonetheless, 1-0 lead. Yet another two-out run on the strength of a multi-hit, no-HR rally. Cold temperatures cost Bogaerts a HR on a ball he mashes high off the Wall in left-center. A ball hit at 104 mph exit velo at that trajectory usually goes out at Fenway. David Freese slid into the first base photographer's pit chasing a foul ball during the second inning. Top: After David Price struck out Chris Taylor (swinging on three pitches) and Matt Kemp (looking on four pitches), Enrique Hernandez popped out to center to end the inning. Price is once again feeling good with the changeup - of the 13 pitches he threw in the 2nd, 8 (61%) were changeups, 7 were strikes. He's selling it well, as indicated by the fact that the Dodgers swung at 6 (2 swing/miss, 3 weak fouls, and a flyout). Price with an 0-0 swing/miss changeup to Taylor to start the second. Dodgers are being very aggressive on first pitches so far. Bottom: Mookie Betts grounded out, Andrew Benintendi struck out swinging, and Steve Pearce popped out for a 1-2-3 inning. Mookie Betts was tagged out by David Freese in the first inning. Top: After lead-off hitter Brian Dozier grounded out and Justin Turner struck out, David Price walked David Freese on six pitches. Manny Machado popped out to end the inning. Price’s pitch count: 13, 8 for strikes. Price works up in the zone against Machado: swing/miss 4-seamer (93mph) followed by a 94 mph 4-seamer for a pop-up. With a lower release point, Price had struggled to work at the top of the zone in 3 starts before ALCS G5. He adjusted to better attack top to bottom. First pitch 90 mph fastball for a one-pitch groundout by Price to open Game 2. Price goes front-door two-seamed to get Turner looking... 92 mph. Dave Roberts won't be throwing out a first pitch but he did jog out to hug his 2004 teammates and tipped his cap to the crowd with a big smile. Loud cheers for the Dodgers manager. Very cool moment at Fenway. Nice that the Red Sox were able to convince Kevin Millar to join in. Guy is a recluse. Schilling forever will be one of the most significant Red Sox players from the 2004 championship team. His political positions have made him something of a lighting rod in recent years. His exclusion from Wednesday night’s ceremony is likely to raise eyebrows. MLB has youngsters from the Boys and Girls Club bring the ball to the mound. Jerry Remy be on the field for that tonight. ■ It was 43 degrees at first pitch. Roberts calls playing in the cold ?difficult...It?s an adjustment... I do know that our guys aren?t going to use that as an excuse.? 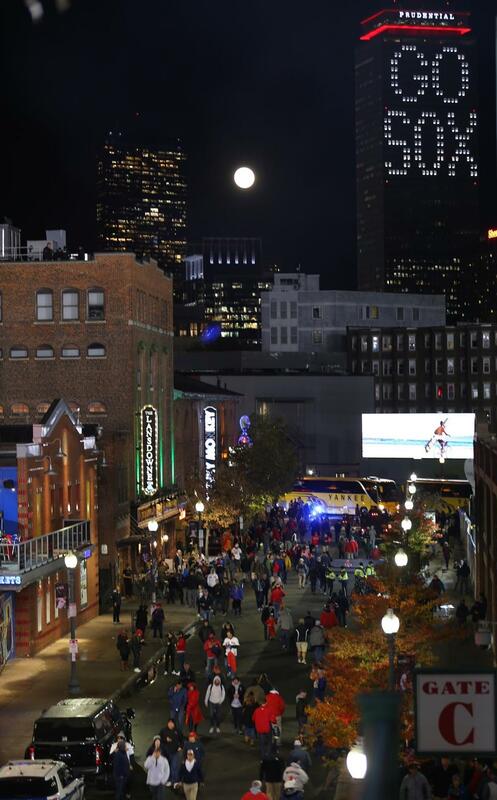 Looking down Landsdowne Street with the the full moon and Prudential building in the background. 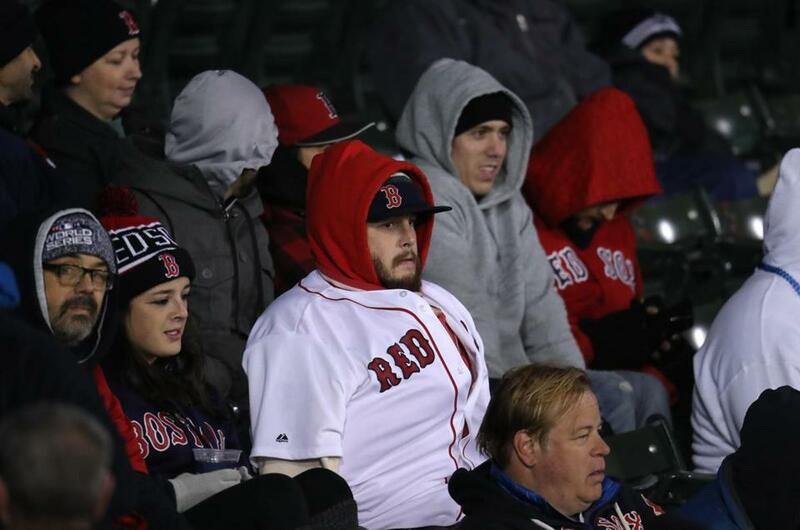 Fans in the stands at Fenway Park are bundled up. 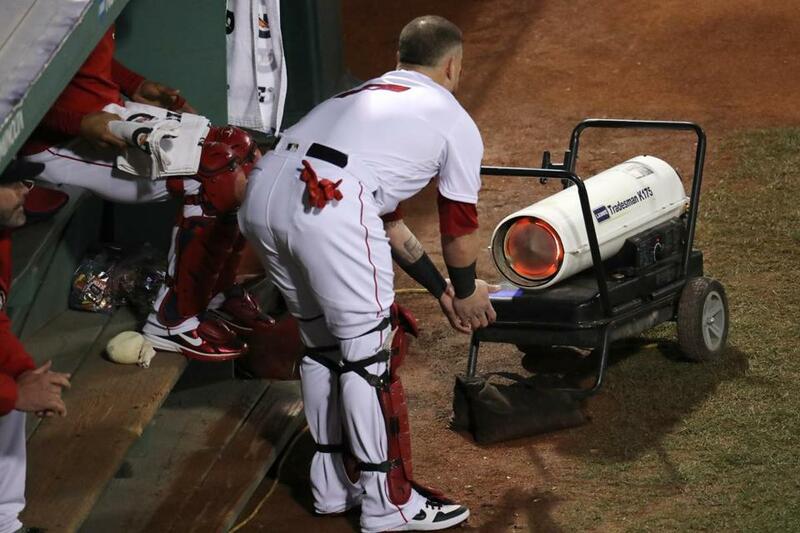 Red Sox catcher Christian Vazquez warmed up his hands in the bullpen before the game. Red Sox will wait until tomorrow to fly to LA in the interest of getting a good night of sleep. Cora says Eovaldi will start, but TBD whether Game 3 or 4. 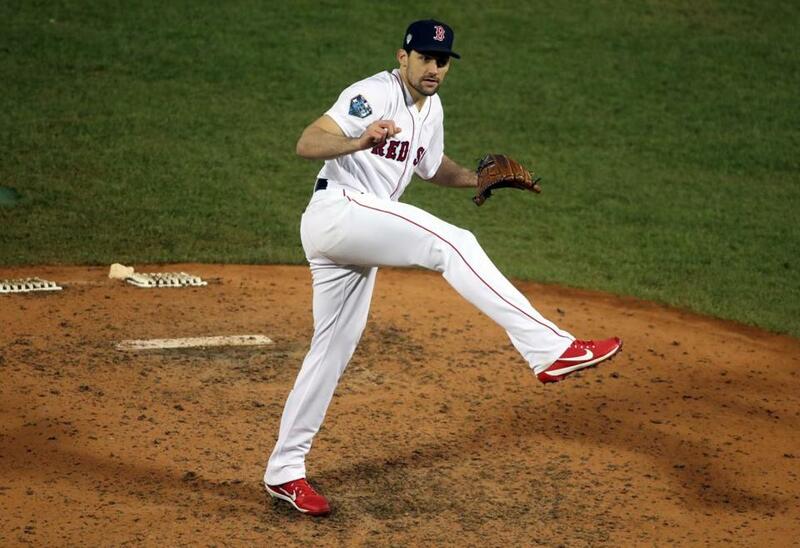 Sox will focus on possible matchups of Eovaldi or Porcello in Game 2 before setting rotation. Cora compares Eovaldi to Charlie Morton last year. 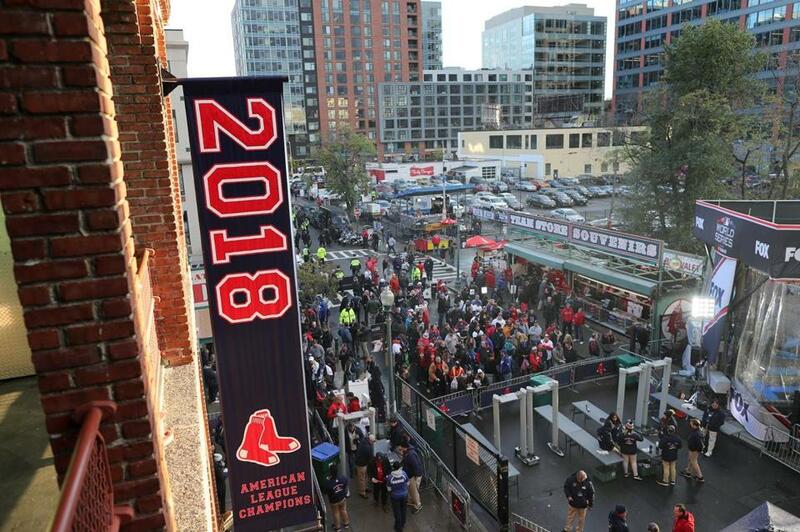 Fans waited to get into Fenway Park. 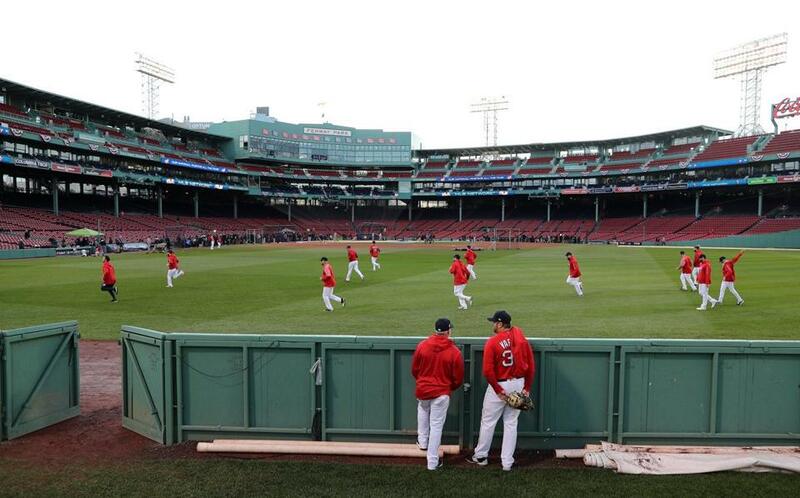 Red Sox players warm up before the game. 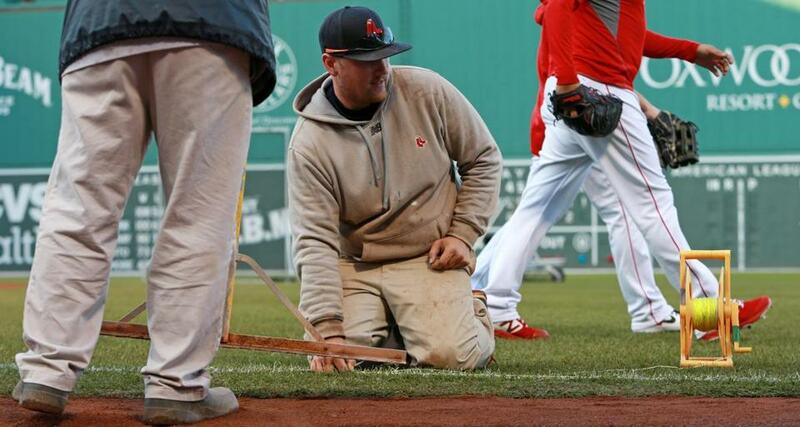 Members of the grounds crew were busy dropping a line in order to rechalk the right field foul line before Game 2. 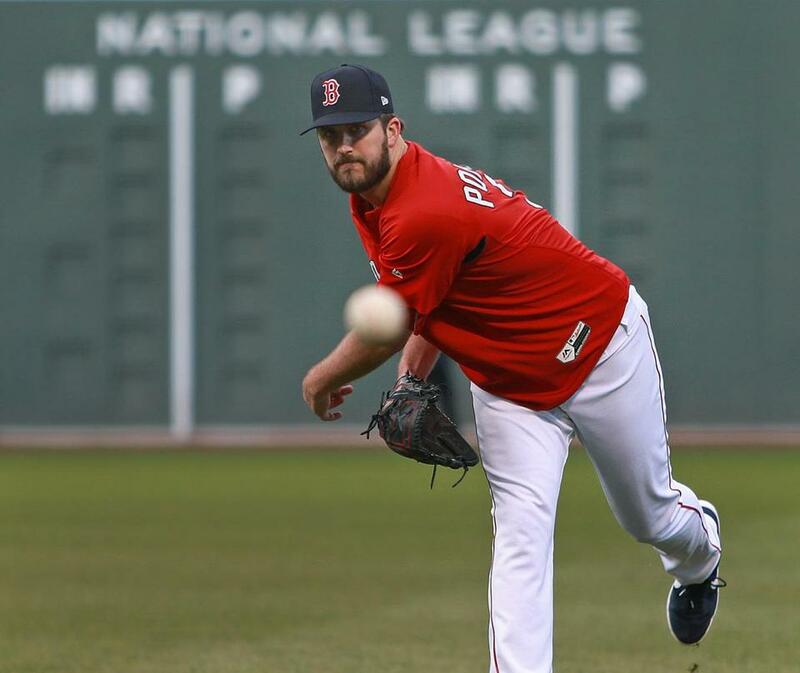 Red Sox pitcher Drew Pomeranz, who was added to the roster for the World Series, got in some throwing in the outfield before Game 2. Holt on the difference between Cora an Farrell: ?Communication. ... There wasn?t a whole lot of communication in the past ... and it?s the whole vibe he brings, the looseness.? Holt says players understand how Cora is seeing the game as it unfolds, which helps keep players ready. Brock Holt was asked in the interview room to compare Alex Cora and John Farrell as managers. To his credit, he was honest. Spoke of Cora being a better communicator and establishing a better vibe and understanding the players. 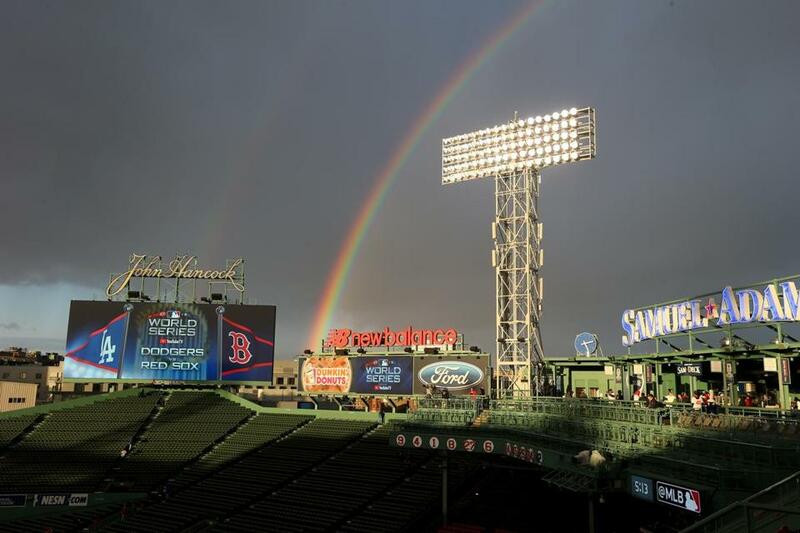 A rainbow over Fenway Park. ■ LHP David Price (1-1, 5.11 postseason) and LHP Hyun-Jin Ryu (1-1, 4.40 postseason) are the starting pitchers. ■ Ryu spent years viewing Fenway Park through television screens, whether in his home country of South Korea or in the United States, where Ryu has been an major league pitcher since 2013. Finally, the lefty got a glance at Fenway’s historic grounds when the Dodgers landed in Boston on Sunday.A certain wall caught Ryu’s eye. “My initial reaction to the Green Monster is, it’s very tall,” he said through a translator Tuesday. ■ Ryu holds runners well. There have been only five steals against him in 97 major league games. It will be interesting to see if the Sox challenge him. ■ The Sox have had a juggernaut offense in the postseason, pressuring the pitcher by putting balls in play and not waiting for a home run. They are averaging 6.4 runs. 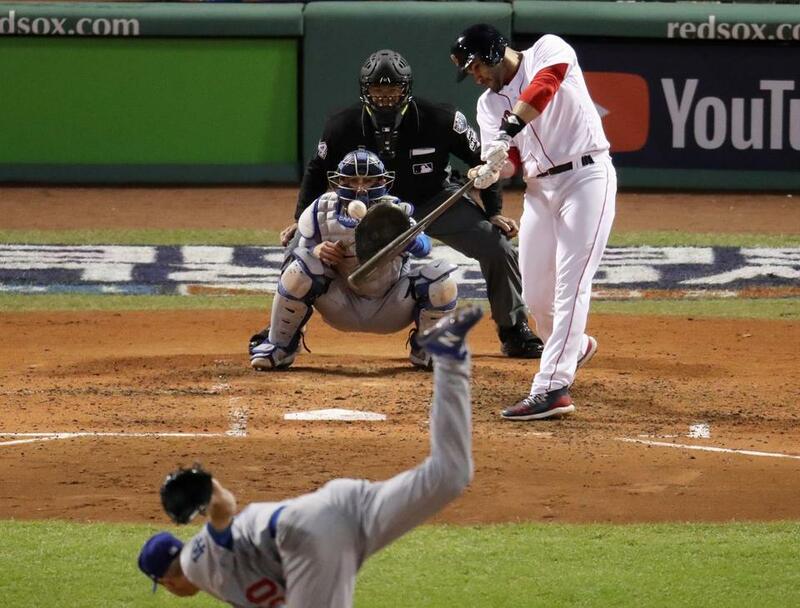 Ryu, who did not pitch well on the road in the NLCS, could have a rough time at Fenway Park. ■ Read Abraham’s full game preview for more notes and nuggets. ■ Price takes the mound tonight after throwing six shutout innings in Game 5 of the American League Championship Series. He received a loud cheer from the Fenway crowd during team introductions ahead of Tuesday’s Game 1. He said before the World Series that he felt “lighter” now that he has a good playoff start under his belt. ■ Ryu is making his fourth start of this postseason. In his previous three outings, he gave up seven runs on 17 hits, struck out 15, and walked two over 14⅓ innings. Opponents had a .283/.306/.433 line against him in those three contests.